Carson Station detectives are asking for your help in locating Julio Cesar Roman. 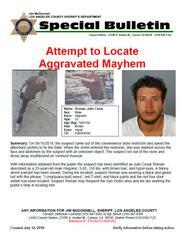 Suspect Roman is wanted for the brutal attack on convenience store clerk, Darlecia D’Andrade, on Saturday, June 16, 2018, at approximately 5:56 a.m., on the 900 block of West Sepulveda Boulevard, Harbor City. Detectives learned that shortly after the suspect entered the local convenience store and made a purchase, he slashed the victim across the face and abdomen with an unknown object. The suspect ran out of the store and drove away, southbound on Vermont Avenue. The motive for the attack is unknown. With the public’s assistance, the suspect has been identified as Julio Cesar Roman. He is described as a male Hispanic 23 years-old, 5’05” tall, 150lbs, with brown hair, and hazel eyes. During the incident, suspect Roman was wearing a black and green hat with the phrase, “I (marijuana leaf) weed,” red T-shirt, and black pants and the red four door sedan has been located. A felony arrest warrant has been issued. 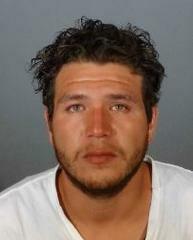 Suspect Roman may frequent the San Pedro area and we are seeking the public’s help in locating him. Victim Darlecia D’Andrade was released from the hospital after being treated for her injuries. She has not been able to return to work since the incident. Carson Station appreciates the kindness and support shown for Mrs. D’Andrade as she recovers. A convenience store clerk was brutally slashed in the face and abdomen in the early morning hours of Saturday, June 16, 2018. On Saturday, June 16, 2018, at approximately 5:56 a.m., the suspect entered the store of the gas station and, after making a small purchase, asked the clerk, 53-year-old Darlecia D’Andrade, if he could use the restroom. He entered the restroom but exited seconds later asking that she fix the toilet. Prompted by the suspect’s request, the clerk entered the restroom as the suspect followed her inside. While both were inside the restroom, the suspect suddenly attacked the clerk, slashing her across her face and abdomen with an unknown object. The suspect ran out of the store and entered a red, 4-door sedan with a sunroof. The front grill of the sedan had vertical slats. The vehicle possibly has a sticker or chipped paint on driver’s side door frame. He was last seen driving away south on Vermont Avenue. The suspect is described as a male Hispanic, approximately 20 years old, dark hair, 5-11, between 160 – 170 pounds, wearing a black and green hat with the phrase “I (marijuana leaf) weed”, red t-shirt, and black pants. The clerk received significant injuries to her face and abdomen. She was transported a local hospital where she was treated for her injuries and released. The victim is a mother of six, and since the brutal attack she has been unable to return to work. The clerk had never seen the suspect before, and there is no known motive for the attack. Carson Station detectives are seeking of the public’s help in identifying the Aggravated Assault suspect, depicted in the video and photographs. Carson Sheriff’s Station polices the City of Carson and unincorporated communities of Gardena, Rancho Dominguez, Torrance and Harbor City.